Natural Inspirations is a distinctive collection of longstrip hardwood flooring featuring unique oaks, select grade maple, beech, and a variety of exotics. With Mohawk's innovative DuraLoc® LS floating floor profile, you can install a natural hardwood floor in a fraction of the time. No messy glue, staples, or nails are required! 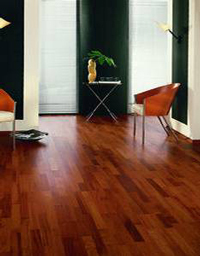 DuraLoc® LS is simply the FASTEST and EASIEST way to install real hardwood flooring.